It doesn’t matter what industry you’re in - gathering feedback from your customers, or potential customers - is vital to success. There is a long and distinguished literature confirming this to be the case. It is the reason that organizations large and small use techniques such as Net Promoter Score: they know that this single measure is often a leading indicator when it comes to the overall health of the business. And of course, beyond those aggregate measures it is also vitally important to continually look for feedback on every aspect of the customer experience. Whilst user data in the form of analytics and A/B testing can certainly help identify strengths and opportunities, surveys and feedback forms can tell you why users behave in the way they do. That’s useful information to have, and can help optimise the full range of product, service and experience much quicker than would be otherwise possible. Most large organizations know all this. They care deeply about asking their customers about customer satisfaction in general, and specific features and products specifically. And on that basis, they have developed a large number of ways in which to make that happen. But there’s a problem - many of those methods rely on channels that are becoming hollowed out by increased mobile usage. To take one example - if you’re a bank that asks branch visitors to complete a short survey during their visit, then you are actively ignoring the vast majority of the customer base. And those users are often precisely those you are most keen to understand (research suggests millennials are more likely to switch bank, and more likely to do so due to service levels). To be useful, any survey needs to be properly representative and properly accurate. That in turn means it must be delivered ‘where the customers are’ and ideally as close as possible to when the customer enjoyed the relevant experience. Enter the mobile app, and specifically the mobile app survey. As already discussed, with so much of the interaction between brand and customer now taking place on mobile, and specifically in the mobile app, it makes it more imperative than ever before to use that channel to deliver surveys (particularly surveys about the app experience itself!) But mobile also addresses the question of timeliness. As that device we carry around with us all day every day, it enables the brand to speak to us in the moment and get accurate data from survey activities. To understand why that is the case, consider a request for feedback after a flight. Are you more likely to get accurate data when asking via the smartphone immediately after landing, or by email a day later? The answer is probably obvious - but to make it clear, delayed feedback is more likely to suffer from false memory syndrome and be heavily skewed towards strongly negative or positive experiences - making it hard to reach any firm conclusions from the data. So if you’ve committed to using the mobile app to deliver surveys, what should they look like? Perhaps the simplest approach is to first understand what they should NOT look like - and that is ‘like conventional online surveys only on a smaller screen’. Like it or not, mobile users aren’t huge fans of complex processes, fiddly fields and typing on a touchscreen. That’s why so many native mobile processes involve simple taps or swipes to enable users to complete common tasks. Asking people who are used to this model to complete large numbers of free text forms is almost guaranteed to reduce completion rates to a point at which results are no longer particularly useful. Instead focus very clearly on what you really need to know, and enable users to tell you - as easily as possible. That means designing surveys that are easy to understand and that can be completed very simply. The star rating and ‘emoticon’ based examples shown below perform this job perfectly - and still give the organization the key information it needs. If you do need further information, deliver this dynamically based on prior responses. 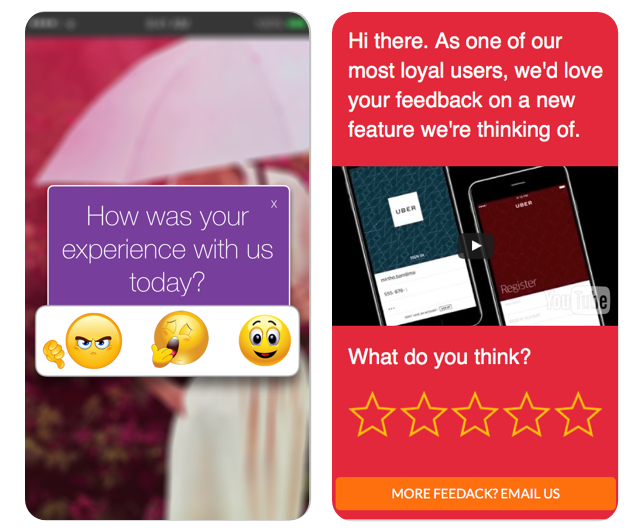 If you’re asking how the app is performing, for example, then show a follow up screen to users who are not satisfied, with a range of options as to why. Only users who have an issue will be shown the screen, it is still easy to complete, and it gives you vital information that can make a real difference to product development and the business as a whole. Lastly, don’t forget that ability to deliver surveys at precisely the right time - no matter what sort of experience you are looking for feedback on. When customers leave a branch or store, you can still fire a push notification that brings them to a survey experience on mobile. It’s not just for measuring the success of the app itself!